I’ve often wondered how our campaign to change the name of my high school’s sports team, the Bedford Road Redmen, would’ve gone differently if there was a man out front. I wonder if the friends and community members who stayed silent during the 3 year struggle in Saskatoon while supporting and posting about mascot-change campaigns led by men in other canadian cities and the U.S., would’ve been more willing (or at least, less afraid) to get involved here. It’s been a year since our campaign led to the Saskatoon Public Schools board trustee vote that finally retired the “Redmen” logo and name. There were plenty of brilliant people, including men, who helped out with the campaign in every aspect, from speaking to organizing to tech to moral/emotional support, but until the end it was often the faces and names of the women that were plastered on high visibility news articles. We weren’t the first to challenge the “Redmen” issue in Saskatoon; that our work stood on the foundations of native women and educators in the prairies like Priscilla Settee and Shauneen Pete, in the 1990s. A lot of the dissenting comments we received were about the group being “too sensitive” and “too emotionally attached to the issue”. 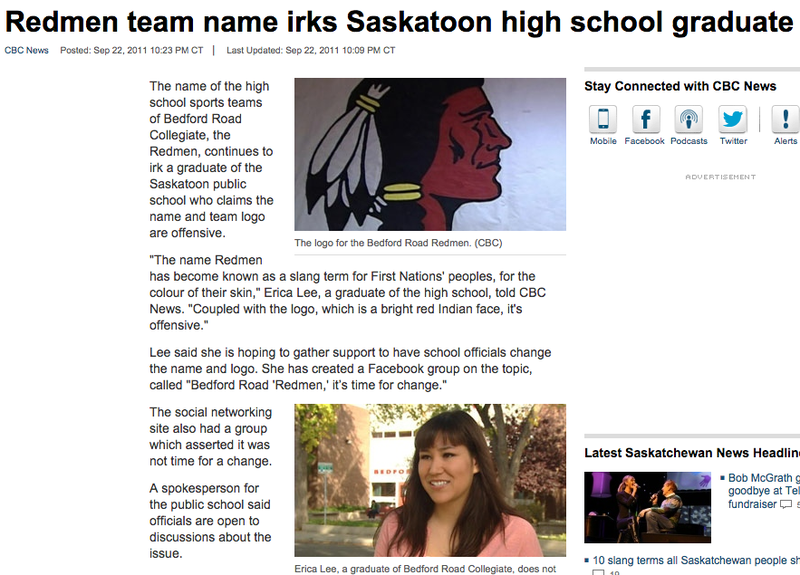 In fact, the very first news article published about our campaign set the tone, with the unfortunate headline “Redmen team name irks Saskatoon high school graduate“, something I never lived down as my friends joked “watch out, Erica is irked!”, poking fun at how the school, the school board, and some media tried to downplay our anti-mascot campaign as nothing more than the boredom of one emotionally-driven young girl. There were also plenty of comments with gendered slurs left on our group’s page, clearly directed at the women involved, sometimes using our names and including personal information, like our locations of work and school. 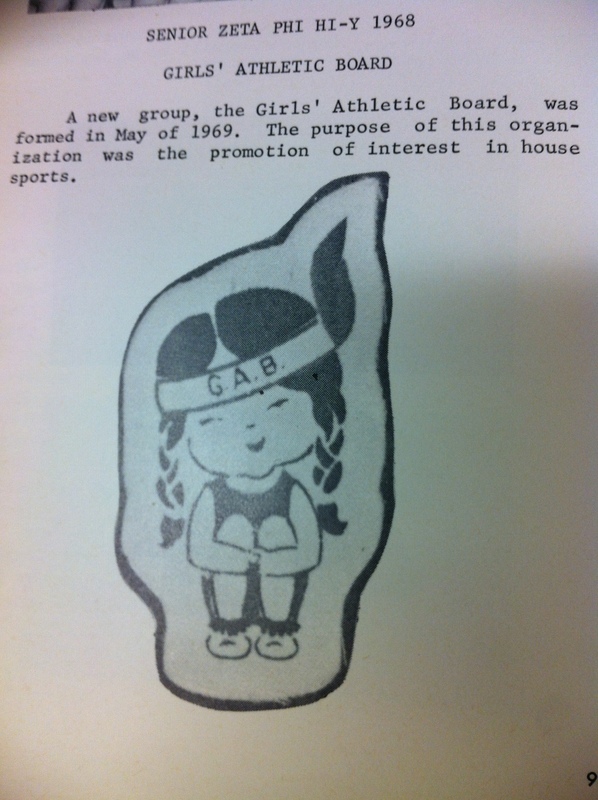 I’m only now starting to think about the implications of notions of masculinity conjured by sports mascots and what it meant for our little group of primarily Indigenous & non-Indigenous women to challenge those notions. What does it do to challenge that silently stoic cartoon “Redman” face and replace it with an image of real-life Indigenous women saying no? As I write this on International Women’s Day, I’m thinking about some of my dearest friends at the University of Alberta cleaning up the vandalism of their tipi memorial to Missing and Murdered Indigenous Women, Girls, and Two Spirits. I tried to take on some of the men attacking them myself, to take the slightest load off of the violence they received for their work. It’s a small gesture, but one that can make a lot of difference when you’re dealing with non-stop hate. I write this as some of my dearest friends across the country are calling out abusive men organizers in our communities via social media and their own personal blogs (since these are often still the only avenues of expression open to us), and fearing for their safety and the repercussions of speaking out against men. Men who are revered in our communities for being “great activists”, and “really good at speaking”, as if that somehow removes the silencing and the abuse they inflict on countless Indigenous women who do the same (and usually better) work with little to no fanfare. Perhaps this is related to rhetoric of care. Indigenous women are expected to be caregivers, to be lifegivers, to be givers. We are expected to put our bodies on the line for our communities, to continuously give ourselves away – to exist for others – to take the violence and respond gracefully – and so our activism becomes somehow less impressive and less valuable. Our resistance becomes less a matter of our intelligence and agency, and more a result of our nature and temperament. There is a serious fear of supporting Indigenous women, girls, and Two Spirits who speak out. I think that fear comes from seeing that we are targeted, and people don’t want to associate with us or our work until they’re sure we’ve “won”, and the threat of deflected or proximite violence is removed. It’s self-preservation in some cases, and I’m not trying to shame other Indigenous/racialized people or women for failing to jump in and expose themselves to violence, but I wish that in situations where Indigenous women & Two Spirits are out there standing up on our own, more voices with privileges would join in to make it a little bit easier. As outspoken Indigenous women & Two Spirit activists, we are made even more vulnerable than we already were, because if there’s anything that pisses off a colonial state, it’s Indigenous women and Two Spirits who not only survive continued attempts at genocide, but thrive and resist and fight and stay angry. I write this as a thank you to all of those who hold me up when I’m not strong enough to take it all on my own, and I promise you that in the moments where I am strong and capable, I will do the same for you.